FULTON – Before Wendy and Walter can say, “I do!,” they face a crazed mobster named Vinnie from Las Vegas. Due to a series of unfortunate misunderstandings, the mobster wants to get revenge on the person he believes has betrayed him. As he threatens an entire wedding party, his girlfriend – a glamorous singer, begs him to stop. The scene is from the fast paced farce What The Rabbi Saw, which is under the direction of Fulton teachers Tom Briggs and Rob Lescarbeau. 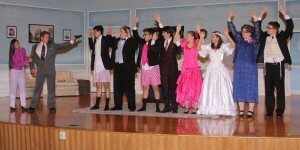 From left are: cast members Gina Babcock, Brandon Webb, Michael Mankiewicz, Jeremy Herlowski, David Houck, Tim McAfee, Victoria Eckhard, Sarah Fisch, Erica Perwitz and Zach Almeter. What The Rabbi Saw is rated PG-13 for mature humor and continues tonight (Oct. 23) and Saturday in the Bodley HS Auditorium. Curtain time is set for 7:30 each evening.